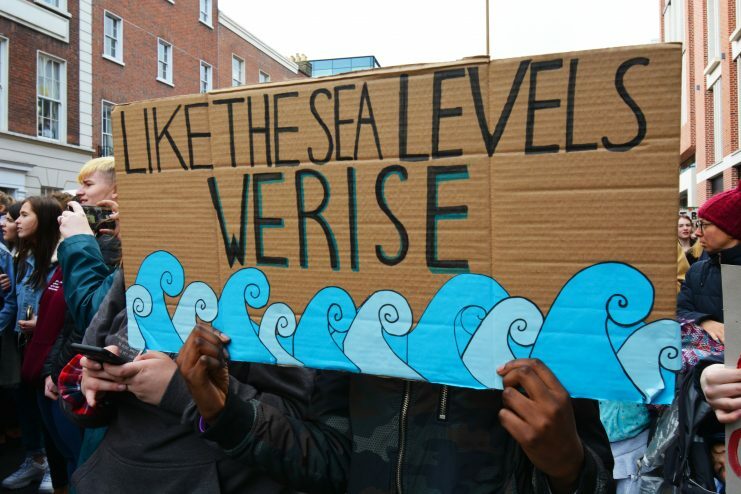 The school strike for climate action last Friday was notable for its energy and size, but also for its unexpected guests – several Fine Gael TDs were front row at the march, congratulating the students. Leo Varadkar called the protest “welcome” and “inspiring” and the Minister responsible for Climate Action, Richard Bruton, asked to speak. Also prominent was Sean Kelly, an MEP who has been a vocal supporter of the Liquefied Natural Gas (LNG) plant proposed for the Shannon Estuary, a project which would lock Ireland into 40 years of fossil fuel energy. Fine Gael’s sudden interest in climate protests is part of the Government’s ongoing attempt to greenwash its’ climate (in)action policies. The tactic of co-opting an antagonist where there is a clear power imbalance i.e. most of the students striking cannot yet vote, is classic corporate greenwashing behaviour, and a technique perfected by fossil fuel companies. For example, when Shell encountered resistance in Rossport, Co Mayo when building the Corrib gas pipeline in 2005, local schools and GAA clubs were the first to benefit from the company’s €10 million of “social investment”. Such tactics are in keeping with Fine Gael’s recent rhetoric on climate action, with expensive advertising fronting their #togetheronclimate campaign. With this, Fine Gael is attempting to create a unifying story to convince citizens that the State is ‘doing its part’, an emotive hook resonant of slogans like Shell’s “People.Planet.Profit” or BP’s “Beyond Petroleum”. Like corporate spin on climate, Fine Gael’s story is a fairy-tale. The notion that we are #togetheronclimate is misguided and pernicious. We may all live on the same planet, but when it comes to responsibility for climate change, and the power to take climate action, we are not all equally responsible or empowered. As School Strikes for Climate has noted, 100 corporations are responsible for 71 per cent of emissions and the richest 10 per cent of people around the world are responsible for 50 per cent of lifestyle emissions. Assigning responsibility for climate change to individuals is to ignore the issues of inequality and climate justice which are fundamental to any conversation around climate change. Furthermore, not everyone has equal power to take climate action. Mr Bruton recently distributed leaflets to his Dublin Bay North constituents exhorting individuals to “make profound changes in the way we live and work”. Suggestions included buying electric vehicles and retrofitting houses for energy efficiency, options accessible only to some individuals. The average cost of a deep retrofit for a home is €20,000 – €40,000 after government support, and grants for e-cars only apply to new vehicles with a list price of over €14,000. Fine Gael has the power, at least within this electoral cycle, to take substantive climate action, by introducing legislative and policy changes. Multiple groups have offered specific, immediately actionable recommendations, such as School Strikes for Climate, Friends of the Earth and the Citizens Assembly on Climate Change. But the government continues to avoid committing to specific policy changes, instead actively blocking key pieces of environmental legislation, including the Waste Reduction Bill and Climate Emergency Measures Bill. The Climate Emergency Bill, which would ban the issuing of new licences for offshore oil and gas, is a fascinating study of politics and power. While it would not immediately halt offshore drilling, passing it would send an important signal to the fossil fuel industry that policy, historically generous to the industry, is no longer on its side. But by persistently blocking of the Bill, Fine Gael has clearly shown where its’ loyalties lie: not with the striking students but with influential fossil fuel lobbyists of Providence Resources and the Irish Offshore Operators Association. Instead of serving its citizens, Fine Gael is “managing” them with corporate spin and cynical co-option tactics, while serving the interests of the rich and powerful. Taking climate action means penalising the polluting industries responsible for climate change. It is time for Fine Gael to recognise this and pass the Climate Emergency Bill to show us that we really are #togetheronclimate. Aideen is a member of Not Here Not Anywhere, a campaign group for a fossil free future in Ireland.